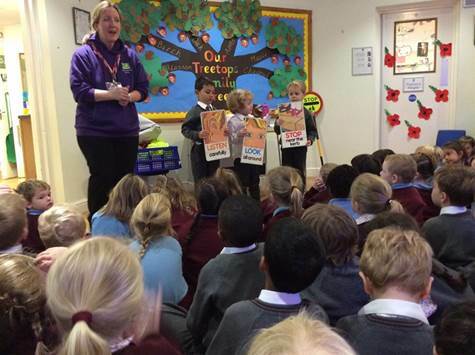 Reception and Nursery children were very excited to have a special visit from Hertfordshire County Council who came to talk to the pupils all about road safety. The pupils enthusiastically named all the different types of vehicles they need to look out for on the roads. We learnt the STOP, LOOK and LISTEN code before safely crossing the road, whilst taking note that we always need to hold an adult’s hand. Everyone then put into practise what they had learned by walking across a pretend road while holding their teacher’s hand. Alongside this they learnt about car safety and making sure our seatbelt are properly fastened whenever we travel in the car. Now we all know how to be safe near the roads!